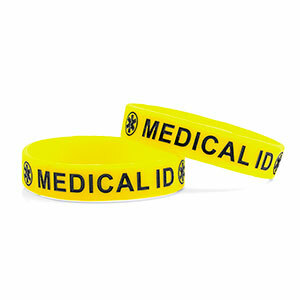 Yellow silicone bracelet with the words Medical ID embossed on surface. Fit wrists up to 5.5 inch. Slide on plastic pieces SDH1000 thru 1004 available as add ons. Just pull silicone tight and add pieces to the bracelet.